I wake up this morning knowing that this is the day to begin. After so many months, I'm inspired to get back in the studio. 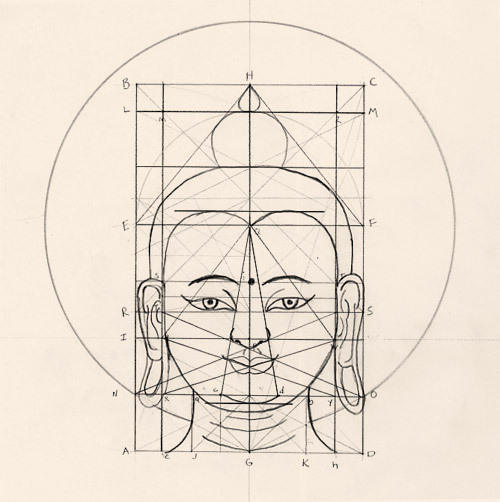 I spend the morning looking through source material, antique carvings of the Buddha, blueprints of traditional proportions, videos of master sculptors at work - feeding my right brain. Late in the afternoon, in the fragrant March rain, I head out to the studio and rolled out a slab of fine white stoneware. I wrap the slab to make a hollow column, and begin moving my hands within and without the column to create the contours of a face. It is exciting; moments of euphoria and fear, elation and discouragement as my hands move in the clay. Shaping subtle facial contours and expressions with my fingers, the question comes to me, what does the face of an enlightened being look like? What aspects of the human face remain? What expressions are wiped away? I am so grateful for a tradition of expression - the deep sweeping eyes, long pendulous ears, the symmetry, the sensual, calm, uplifted mouth - how could I make these decisions without the wisdom in the hands of so many artists before me? This first attempt is clumsy, the facial proportions are amateur and wrong. Still some moments of transcendence are recorded in the clay, in the sweep of an eyelid, the swell of a nostril.